HTML-Optimizer is the 'finishing touch' for your web site. It speeds up your site by optimizing both HTML and script code - without corrupting it. 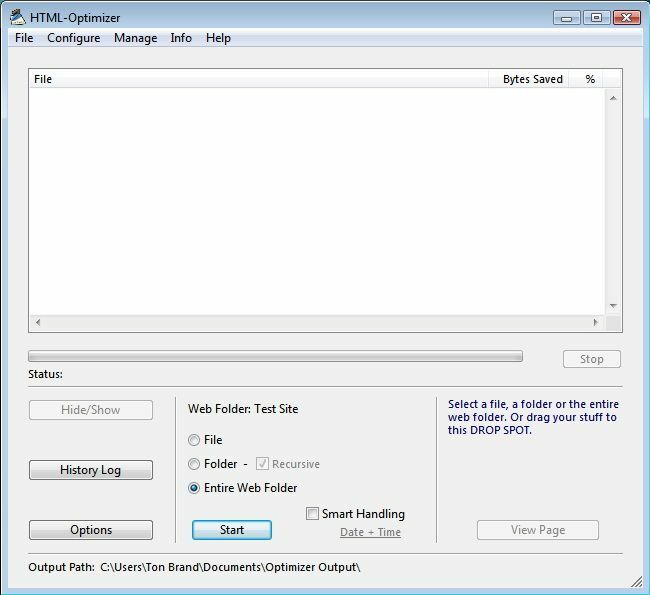 HTML-Optimizer helps you keep organized by creating a duplicate site folder for the optimized files. An added benefit is that it leaves your original files untouched. You should use your original web folder for editing and use the duplicate web folder for uploading. Drag and drop is supported. * All optimizers optimize JPEG and PNG images, cutting down image size by about half. * To help you keep organized, a duplicate web folder is created for the optimized web files. Your original files are left untouched. * The Smart Handling feature enables you to automatically handle only the pages that you have changed. * You can exclude certain files and/or folders from being optimized. * Drag and Drop is fully supported. On the program's Drop Spot you can drop a web folder, subfolders or files. * In the Options panel you can customize the optimization options. * HTML-Optimizer Plus and Web Site Maestro can upload your optimized files to MobileMe iDisk or FTP servers, also in secure mode. Qweas is providing links to HTML-Optimizer 10.5.9 as a courtesy, and makes no representations regarding HTML-Optimizer or any other applications or any information related thereto. Any questions, complaints or claims regarding this application HTML-Optimizer 10.5.9 must be directed to the appropriate software vendor. You may click the publisher link of HTML-Optimizer on the top of this page to get more details about the vendor.